This piece from Kraus brings a modern look to many kinds of bathroom styles. This single-control faucet has a timeless design that looks great in any bathroom. Its deck mounted design can be set up with ease on your counter top. This faucet is WaterSense certified so it uses less water and energy. This new piece from GLACIER BAY brings fresh water fast and adds a stylish look to any bathroom. This single-control faucet adds a classy look to any bathroom project. Make your bathroom look like new with this item's deck mounted design. 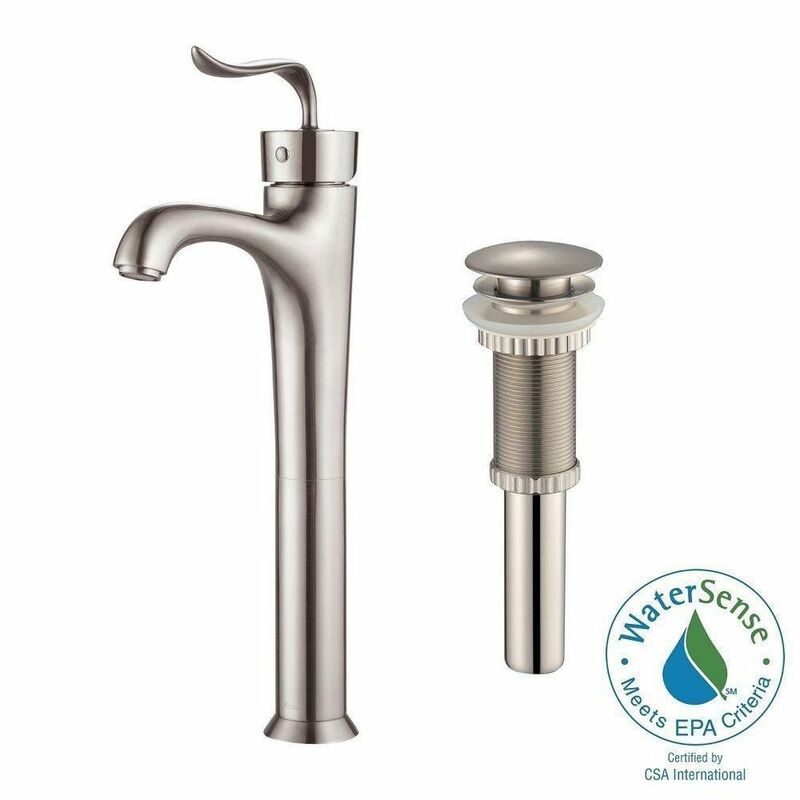 This faucet is also WaterSense certified so you and the environment can enjoy less water use but also stay clean. Coda Single Hole 1-Handle High Arc Bathroom Faucet in Brushed Nickel with Lever Handle This piece from Kraus brings a modern look to many kinds of bathroom styles. This single-control faucet has a timeless design that looks great in any bathroom. Its deck mounted design can be set up with ease on your counter top. This faucet is WaterSense certified so it uses less water and energy. Coda Single Hole 1-Handle High Arc Bathroom Faucet in Brushed Nickel with Lever Handle is rated 4.8 out of 5 by 6. Rated 5 out of 5 by Jules from Easy faucet installation. Just 2 color-coded connections on the faucet, so you won't accidentall... Easy faucet installation. Just 2 color-coded connections on the faucet, so you won't accidentally mix up hot and cold. Feels durable and sturdy. Perfect with my above mount glass sink. Rated 5 out of 5 by Anonymous from Beautiful This faucet is like a piece of art it is so beautiful. Not a scratch or damage anywhere on it. However....it did not come with the instructions to install the pop-up drain. And I understand this is quite complicated to do correctly. I hope to be receiving these from the manufacturer soon.